Alan Archambault, noted author and historian, will present his latest book, published by Arcadia Publishing Company. Tues, May 24th, 7 pm- Fort Lewis: Cold War to War on Terror, Lakewood City Hall Council Chambers, 6000 Main St SW. The book will be available for sale with a book signing. 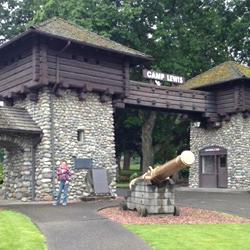 Alan will also discuss the plans for Joint Base Lewis McChord’s commemoration of the Centennial of Camp Lewis in 2017. Thurs, June 2nd, 10 am-1 pm-Senior Activity Center Open House, 9112 Lakewood Dr. SW, visit Society’s booth, free drawings and refreshments. Sat, June 4th, 1-6 pm-”Celebrating our Dynamic Future”, Lakewood Towne Center, the City’s second 20th Anniversary celebration, first Food Truck Rally, music by Afrodisiacs, displays, lots of activities for kids. Tues, June 14, 10 am-3 pm-Lakewood Farmer’s Market, Lakewood City Hall, 6000 Main St SW. Be sure to stop by the Society booth to participate in the trivia contest and drawing.